AMD's Graphics Product Group has been on a bit of a role since the release of its new ATI Radeon HD 4000 architecture at the end of June, as it managed to catch Nvidia with its pants round its ankles. Overnight, AMD's position in the market changed from one of damage control to one where its products offered significantly better value in the crucial enthusiast segment. The lime green giant wasn't particularly jolly when it had to apply significant price cuts to its new GeForce GTX 200 series hardware following the 4850 and 4870's arrival. Nvidia's CEO and President Jen-Hsun Huang admitted as much (without any mention of the pants, mind you) during the company's rather sombre second quarter financial earnings call, which took place on the eve of the Radeon HD 4870 X2 launch. This was really the icing on the cake for AMD, as it managed to retake the performance crown with the 4870 X2 by an unprecedented margin. Sure, the Radeon HD 4870 X2 has its flaws, which are mainly associated with its reliance on software for optimal scaling, it is by far and away the fastest single graphics card we've ever tested. Over the course of these two launches, AMD talked very consistently about its deployment strategy for the Radeon HD 4000 series. It's clear that AMD achieved its first two goals – first, to build a pair of kickass graphics cards targeted at the enthusiast segment, and second to win the performance crown with a multi-GPU solution. Today, AMD is hoping to leverage the same technology that enabled it to successfully complete its first two goals to win in the mainstream space. It's about time I introduced you to the ATI Radeon HD 4600 and 4500 series, which from today will occupy the mainstream and value segments of the market. Today, we're looking at the fastest of the new cards, the ATI Radeon HD 4670 512MB, to find out how it stacks up against the Radeon HD 3800 series and also what Nvidia has to offer at similar price points. The ATI Radeon HD 4670 is based on AMD's RV730 XT graphics chip and is basically a cut down version of the RV770 architecture – all of the design principles applied in the chip are carried across to RV730. Because of this, we'd recommend giving our Radeon HD 4800 series architecture analysis a read if you're looking for more detail on where, how and why AMD has improved certain aspects of its architecture. 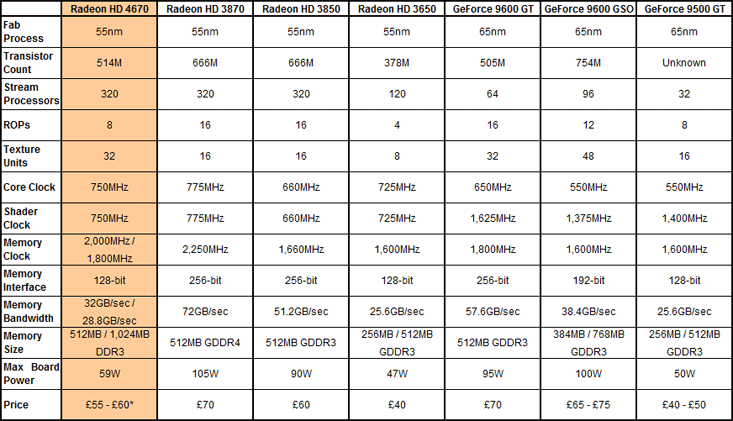 * - estimated street price, based on US pricing supplied by AMD. RV730 packs the same number of stream processors as RV670—the chip behind the Radeon HD 3850 and 3870 cards—meaning there are 320 of them arranged into 64 five-way superscalar shader units. It packs 514 million transistors and is built on TSMC's 55nm process – the transistor count is quite a bit lower than RV670's, but that's because AMD has abandoned the transistor-hogging ring bus memory controller architecture and has made other optimisations inside the chip. While we're talking about the memory bus, AMD has opted for a 128-bit bus to memory on RV730 – it's a shame that AMD hasn't opted for a 256-bit bus on its mid-range chip. We can but hope. One thing's clear though – AMD has to kept performance per dollar firmly in mind when it was designing this chip. It said as much, again, just like it did when RV770 launched – but we'll have to see how that works out over the course of our testing. ATI's latest GPU targets the lucrative mainstream market, bringing Direct X 11 to a sub £80 price point. With no need for a PCI-Express power connector, is the Radeon HD 5670 the ideal hassle free upgrade? We find out. Catalyst 9.4 is released just three weeks after Catalyst 9.3, featuring a new Auto-Tune tool in the Overdrive section of the Catalyst Control Center.